Liverpool welcome Fulham to Anfield on Tuesday evening for their last league game before the massive FA Cup final at the weekend. The Reds recorded a confident win over Norwich on Saturday thanks to a glorious Luis Suarez hat-trick and here's hoping that sort of result is repeated. Fulham have the chance to go level with Liverpool in the league on Tuesday which is a worrying thought considering Liverpool haven't finished 8th or below in the league for 58 years and already find themselves in a sticky situation with the Toffees just above them. The last time the two sides met Clint Dempsey rubbed salt into the wounds with a late winner. The problem was, really, he shouldn't have been on the pitch after the headbutt on Craig Bellamy, maybe Bellers should have jumped to the floor like Perch did for Newcastle. Liverpool put three past Norwich at Carew Road on Saturday as the Reds got themselves back to winning ways in the League. A stunning hat-trick from Luis Suarez sent the away fans wild and with little left to play for in the League other than perhaps topping Everton, it was an exciting and refreshing 90 minutes from the Reds. Dalglish opted for a slightly different starting line up, perhaps due to having one eye on next weekends fixture. Carragher was in the defence and Downing and Shelvey also made the start. Norwich had to make a substitution early on in the game when Adam Drury went down injured. Russell Martin took his place. It didn't take Liverpool long to find their first goal and after some good pressure from the Reds Luis Suarez found the back of the net. Set up by Steven Gerrard the Uruguayan with a lovely finish curled the ball past Ruddy, it looked like it was about to go wide but it slotted itself in and put the Reds 1-0 up. Liverpool face the Canaries on Saturday as they look to end April on a high. Norwich have lost their last two league games but they have been a breath of fresh air since they were promoted from the Championship last year. Injuries for Liverpool mean they are without Charlie Adam but captain Steven Gerrard was back in training and is expected to be available for Saturday's game. Norwich are without ex Reds man Daniel Ayala who is suffering from a knee injury and also unavailable is Marc Tierney. The last time the two sides met was in October. A 1-1 draw in which Liverpool played quite well was a string of many poor results at Anfield for the Reds this season. The last time Norwich beat Liverpool at Carew Road was in 1993 which to be fair isn't that long ago considering how infrequently the sides have met. Liverpool will welcome West Brom to Anfield on Sunday after they've got rid of those giant puppets wondering around the Kop End! And West Brom coming to Anfield means nothing less than the return of the face rubber himself; Roy Hodgson. The first piece of team news for Liverpool has been eagerly anticipated... That's right, Reina is back. Despite a great performance from Brad in the FA Cup I think everyone has missed the security of Pepe Reina and thank god he's returned. Other than the long term injuries within the squad, Dalglish doesn't really have anything to worry about and can select a side from a pretty in shape squad. West Brom have doubts hanging over the fitness of Fortune because he's suffering from a hamstring problem but Olsson is expected to return for the Baggies. Hi folks! For those of you that follow me on Twitter you've probably noticed that for a few weeks now I've been mentioning my Research Skills project for college and you probably also noticed when I was asking for people to complete a survey about ticket prices at Anfield... Basically I've been annoying the hell out of my followers. Well today I handed in my completed report and I have put it online too (embedded below). I'd just like to say thank you to everyone that completed the questionnaire because without your answers I wouldn't have been able to complete the report. I've tried to make it as professional as possible, it is quite in depth but for those who don't fancy the full read, the graphs and charts supply visual responses to the questions asked in the questionnaire. I hope you find it useful/interesting and any comments, good or bad are appreciated! After an afternoon at Wembley that began with both the Red and Blue sides observing a minutes silence for the 96 Liverpool fans who lost their lives at Hillsborough it was the Reds who could boast about their ticket to the final. An 86th minute header from Andy Carroll grabbed Liverpool their win. Dalglish has started quite a strange team in a sense, whilst it had both Suarez and Carroll up front which was expected it had Daniel Agger playing at left back. It wasn't a perfect idea but it doesn't really matter now because it all worked out in the end. Brad Jones as predicted started in goal for the Reds. For those of you that enjoy the posts i do when i end up chatting to you about my day watching the match then you'll probably like this one, it's bound to contain anecdotes of me and my brother in the pub haha. Today we remember the 96 Liverpool fans who lost their lives at Hillsborough on the 15th April 1989. 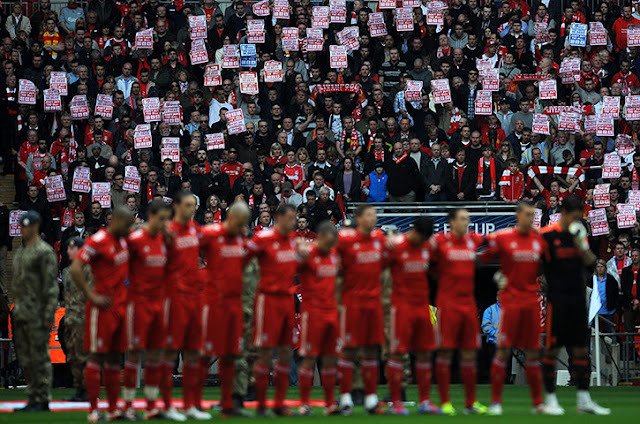 No football fan should attend a football match and not return home to their loved ones. As the independent Hillsborough panel continue to sift through the thousands of documents, here's hoping we are edging closer to justice. We're going to Wembley thrice? Well, that's certainly Liverpool's aim as they travel down to Wembley with the blue half of the city on Saturday. A win here for the Reds could send them to their second Wembley final of the season and as many Liverpool fans will admit another trophy in the cabinet would just about balance out the poor league campaign this season. Injuries for Liverpool mean that Lucas, Adam, Kelly and Robinson are all unavailable but luckily for the Reds Daniel Agger and Glen Johnson have now got some game time under their belts after coming back from injury. Suspensions also mean that goalkeepers Pepe Reina and Alexander Doni will miss out. For Everton their only real missing puzzle piece is Rodwell who has a hamstring injury. Pienaar is also cup tied but other than that the manager should have a free choice from his squad. Liverpool grabbed themselves a win in dramatic style at Ewood Park on Tuesday night in a 3-2 victory over Blackburn Rovers. Two early goals from Maxi Rodriguez gave the Reds a cushion in just 16 minutes but after goalkeeper Doni was sent off for Dalglish's side, Blackburn managed to get two goals in to bring things level. Andy Carroll was there when Liverpool needed him most though and sealed three points with his head. The Liverpool side had several new faces within it as Dalglish kept an eye on Saturday's clash with Everton in the FA Cup semi final. Maxi Rodriguez was one face we haven't seen in a while and the likes of Glen Johnson and Sebastian Coates were opted in defence. Liverpool have a midweek trip to Blackburn on Tuesday as they aim to improve on their draw in the league with Aston Villa. It's no secret that goals and wins have been evading the Reds lately and with an important FA Cup Semi Final against Everton at the weekend, they need to find form, fast. Injuries for Blackburn mean Steve Kean could have to readdress his starting line up, Olsson gained a knock in Blackburn's last match and so is a doubt and Kean is also without Modeste who is suspended. Liverpool still have long standing injuries within the squad but thankfully after Agger made an appearance against Aston Villa it is expected he will feature once again. Doni is also sure to start in goal as Reina serves his second match ban. Blackburn have lost their last three in the league but have still produced some decent and sometimes threatening performances. At times during their game against Manchester United it looked like they may keep them out but they went on to lose 2-0. Liverpool managed to make a slight improvement on recent form as they held Aston Villa to a 1-1 draw at Anfield on Saturday. Aston Villa took the lead with a goal from Chris Herd but Luis Suarez equalised late on for the Reds. Dalglish appeared to give Andy Carroll a reality check as he was allowed only to start from the bench. That man Kuyt who never gives up was opted to start and aided Suarez up front. With Reina beginning his suspension, Doni was chosen to play between the sticks. Villa got their goal very early on and almost sadly, it wasn't even a surprise. This sort of thing was expected because Liverpool of late have just been terrible. The good thing was that with 80 minutes left, just maybe we could do something about it. Aston Villa are the visitors to Anfield on Saturday as the Reds look to readdress their form in the league. Dalglish's side have only had some joy of late when they beat Everton but results against the likes of Newcastle, QPR and Wigan have brought Liverpool back to a cruel reality. Aston Villa also find themselves in a bit of trouble as they risk being dragged into a relegation dog fight. Liverpool are still without Charlie Adam but Daniel Agger could be a possible choice for manager Kenny Dalglish. The real problem of course for the boss though isn't with injuries it's concerning the fact that Pepe Reina is suspended for 3 matches. Doni or Jones will make a start on Saturday and it will be interesting to see who is chosen. For Villa they are without Weimann who has an ankle injury and Cuellar is considered to be a doubt for Saturday's fixture. Liverpool fell to a 6th defeat out of 7 league games on April Fool's day as Papiss Cisse confidently put two past the later dismissed Pepe Reina. In an embarrassing display which actually began with a lively start from Liverpool, fans were left completely deflated as they made their way back from St James' Park. Dalglish appeared to have listened to the calls from fans for the likes of Shelvey to start and he also played both Carroll and Suarez. He also opted for a more positive line up adding Bellamy to the two up front, on paper and before kick off that team looked good, it was a total change and to me after recent results it was exactly what was required.